I came across this game idea at My Montessori Journey. She made her game board using St. Patrick's Day themed stickers, but I couldn't find the right kind of stickers to make my own. So, my very supportive (and much more talented) hubby made me this for me using Photoshop. Click here if you'd like to print your own copy. You will need: a die, a marker of some sort for each person playing (we used Little People), a small cup or bucket to use as a "pot", and fake gold coins. How to play: Put your markers on the "Start" space. One player rolls the die and moves their marker that number of spaces. If a player lands on a gold coin space, they get to take a fake gold coin from the "pot." 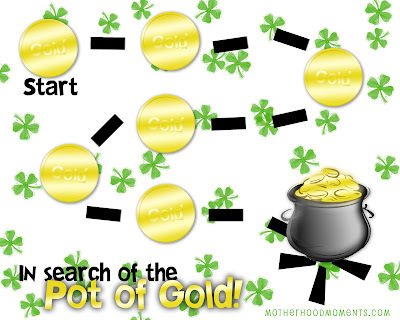 Keep going until both players reach the "pot of gold." The player with the most number of gold coins at the end wins! I am a stay-at-home-mom to FOUR fun little boys (yes, I'm totally outnumbered!). I love planning crafts, games, and other types of activities to do with my boys. This blog is a place for me to store and share my ideas as well as the great ideas I come across in other places. It is also a place for me to record some of my "motherhood moments" - especially the joyful ones! Copyright 2010 Motherhood Moments. All rights reserved.. Powered by Blogger.